What’s a basic way to study light? Well, don’t stare at light and hurt your eyes. Please. A better method is spectroscopy – which spreads a light source out. You could use a prism for this. As the full spectrum of visible light travels through a prism, the wavelengths separate into the colors of the rainbow because each color is a different wavelength. Violet has the shortest wavelength, at around 380 nanometers, and red has the longest wavelength, at around 700 nanometers. 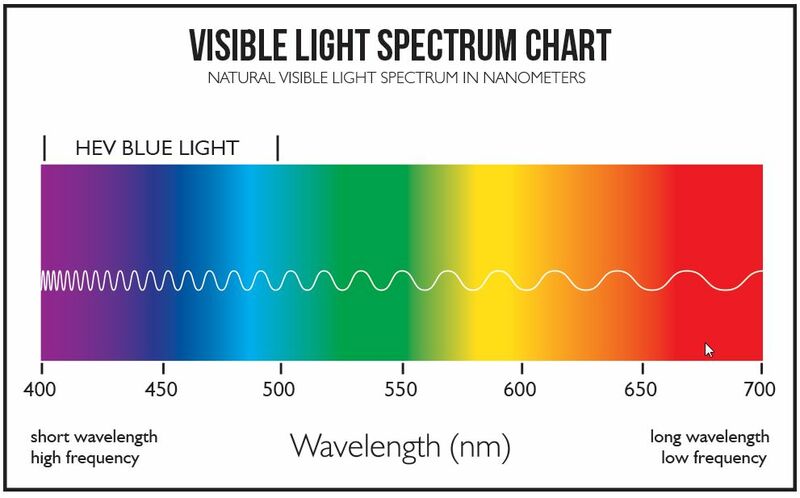 If the light doesn’t pass through any low-density gas, the spectrum shows no features and is considered a “continuous spectrum”. If the light however passes through a cool “cloud” of gas, that “cloud” can absorb particular wavelengths and we can an adsorption spectrum. If you don’t have a prism, you could instead use an imaging Fourier transform spectrograph (IFTS). You probably have one in the telescope you live in on top of that mountain right? A spectrograph is an instrument that separates incoming light by its wavelength or frequency and records the resulting spectrum in some kind of a detector. This device will produce a spectrum that features spectral lines. The appearance of spectral lines is caused by atoms and molecules in a material that the light is passing through. Those atoms and moelecules both emit and absorb radiation at distinct wavelengths. The figure above shows absorption spectral lines in light from the sun. The wavelength scale is measured in Angstroms (1 mm = 10,000 Angstrom) or 400 nm – 750 nm. Absorption lines will appear when there is a hot light source (like our Sun) passing through an intra-meaning cool material (like gas). The radiation is absorbed by the cooler gas causing the lines (or reduction in intensity corresponding to the spectral transitions of the elements in that gas). For most elements, there is a certain temperature at which their emission and absorption lines are strongest. 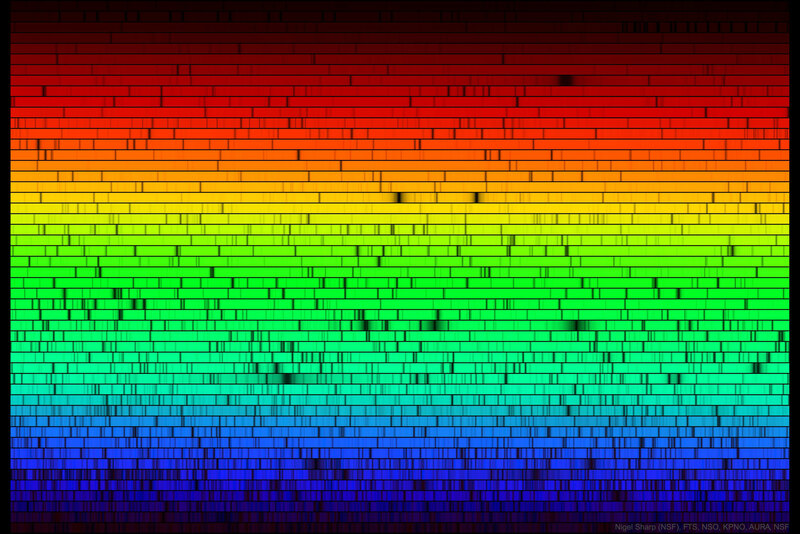 The lines you see in a star’s spectrum act like thermometers. This picture below looks like its the poster down the hall from me, but upon close inspection, its actually different. The same scientist, Bob Kurucz involved with the original poster made a version 2. This spectrum below was taken through the atmosphere, through oxygen and water lines in addition to the solar lines. 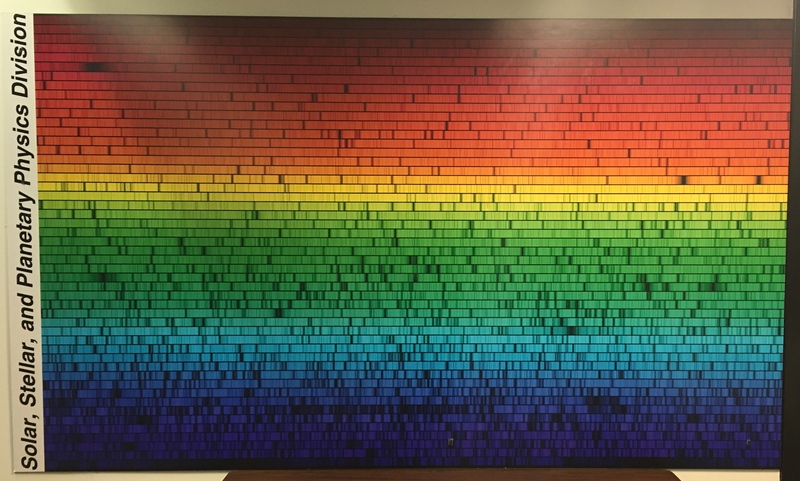 In the spectrum on the wall, he has removed the O2 and H2O lines so the spectrum looks the way it would appear above the atmosphere. It is the way the sun would look from a planet or another star. And here is the poster I get to see every day.